In Chameleon Moon, RoAnna Sylver introduced the dystopic city of Patrol, who’s citizens lived a precarious life above eternally blazing fire, governed by the nefarious Eye in the Sky. Oh, and most of these citizens also had some form of superpower – the reason they were trapped within Patrol. In this sequel, Slyver takes us outside the city of Patrol. But as it turns out, the world beyond isn’t all sunshine and happiness. A poisonous wasteland named Tartarus has infected much of America with noxious fumes and eerie ghosts. Three teenagers will have to brave this danger zone to bring hope to Patrol. 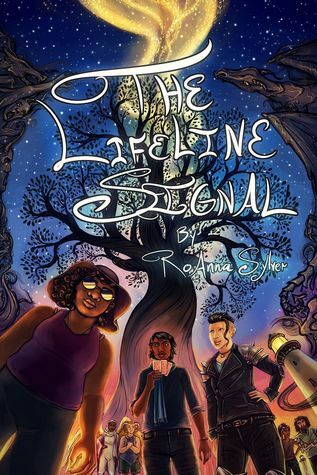 The protagonists of The Lifeline Signal are all new characters, but I still suggest reading the books in order. I can’t imagine coming into The Lifeline Signal without the background of having read Chameleon Moon – I think it would be much too confusing. Going into The Lifeline Signal, I didn’t realize that it would be switching to all new characters. A couple of characters I was familiar with from the first book make brief appearances, but the majority of the cast was either entirely new or was referenced but never seen in the original book (ex. Radio Angel, CyborJ). I’ve got to admit, at first I was sulky about this. I missed Regan and Evelyn! But as the book moved on, I got out of my funk and started connecting with the new characters. Annie is a survivor of Patrol, sent to find Maureen Cole, a genius and expert on Tartarus, and deliver the some key information Maureen possesses back to Patrol. Along with Mareen, Annie meets two other teenagers, Chance and Shiloh, Maureen’s teenage child. Chance and Shiloh accompany Annie on her mission, which takes them to the Firerunner, a land ship that sails through Tartarus. These books are slower, more character focused than I’m used to finding in dystopian novels. I don’t think that’s a bad thing, but I would have appreciated a tad more action. The middle of the novel in particular felt slower paced and really dialog/conversation heavy. A bit more action in this section would have really helped with the pacing. I always want sequels to expand upon the world of the book, and The Lifeline Signal does a brilliant job in this regard, from the new characters to settings outside of Patrol. However, many questions linger. What is going on with the ghosts? And where is Regan and what’s he up to? What was on Maureen’s flashdrive? I guess I’ll have to wait until book three to find out! I can hardly wait. I received an ARC from the author in exchange for a free and honest review.